One of the first immediately noticeable uses for an Android device is as a tool. Before all the games, keyboards, and productivity apps, people were finding ways to use their Android devices as a tool to make every day life easier and it’s still among the best reasons to own a smartphone. If you’re looking for the ultimate tool for your Android phone or tablet, we have the one you need – an amazing app called Caller Name Announcer. The developer team (Innovative Technology) of this app has already launched popular Android apps, such as Automatic Call Recorder, Mobile Cleaner, Language Translator and Flash on Call and SMS and has done it again. They created a great tool for anyone who can’t use their hands while working, driving, typing or exercising and for situations when your phone isn’t near you. 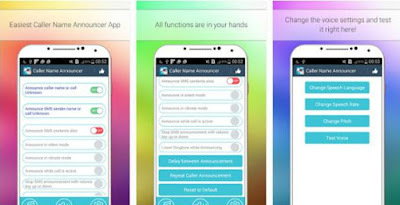 The Caller Name Announcer app is user friendly, with appealing and soothing backgrounds. This app speaks out the name of the caller who called you using its built-in text-to-speech feature. This app not only announcers callers name but also is capable of announcing the name of the person who’ve just sent you an SMS with the ability to read out the SMS content as well. It also offers multiple customization option which can be sued according to your priorities. Requiring only Android 2.3 and up, the app is free for download on the Google Play Store.